The United States Open final between the tennis legend Serena Williams and Naomi Osaka, a rising star in her own right, could have been a celebration of talent and determination, regardless of the outcome. Osaka went on to win the game in two sets, 6-2, 6-4, but she was also upset and apologized to the crowd and Williams’s fans. 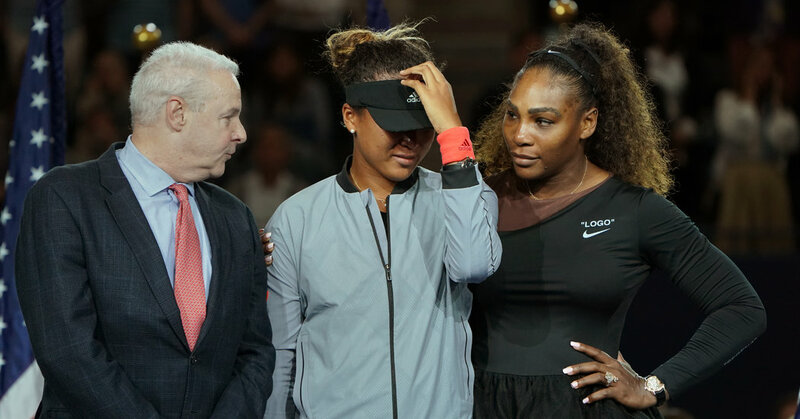 Reactions on social media largely focused on the umpire, Carlos Ramos, for penalizing Williams for behavior that critics said would ordinarily result in just a warning for other players. On Sunday, Williams was fined $17,000 for three code violations, The Associated Press reported. James Blake, a retired tennis star, tweeted that he had said worse things on the court and did not get penalized. Billie Jean King, a tennis legend and a pioneer for women in the sport, congratulated Osaka in a tweet before thanking Williams in a separate one for calling out a double standard between men and women in the sport. On Twitter, some people pointed out that the treatment of Williams as a woman, particularly a woman of color, was especially egregious. Others on Twitter hailed Williams for her strength and courage. At a news conference after the match, Williams was asked if there was anything she would have changed about the game. She stood by her statements to call Ramos a “thief,” adding that she would continue to fight for women’s equality. She said her experience was an example for future players who want to express themselves and be strong women. April 7, 2019 Comments Off on Democrats Rethink the Death Penalty, and Its Politics.